Careful review of OCT images provides a deeper dive when the clinical picture is unclear. Our diagnostic modalities should work together in the management of our patients with glaucoma. 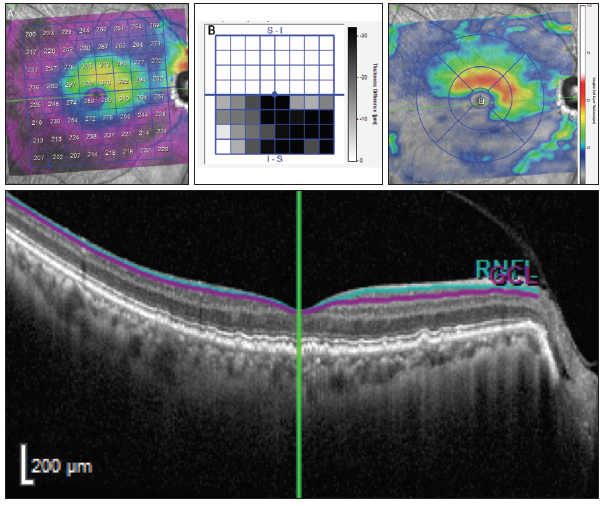 Information derived from spectral-domain OCT (SD-OCT) imaging should supplement visual field (VF) results and clinical examination findings and thereby increase the clinician’s confidence in glaucoma management decisions. SD-OCT can reproducibly provide accurate measurements of the optic nerve head (ONH), retinal nerve fiber layer (RNFL), and macula. VF results should reflect the impact of structural damage noted clinically and on OCT. However, in real-world practice, OCT results do not always agree with the findings of the clinical examination or VF testing. Also, individual OCT parameters (ie, ONH, RNFL, and/or macula results) may seem to disagree with and even contradict one another, and therefore yield an inconclusive summary report. There are many potential reasons for discordance among OCT parameters relative to each other and to VF results and/or clinical examination. These may include nuances in the segmentation algorithms, confounding effects from coexisting pathologies, presence of artifacts, limitations of the reference database, and variability of the tests. Also, structure and function discordance may be related to the different characteristics of the tests, such as measurement properties and dynamic range. 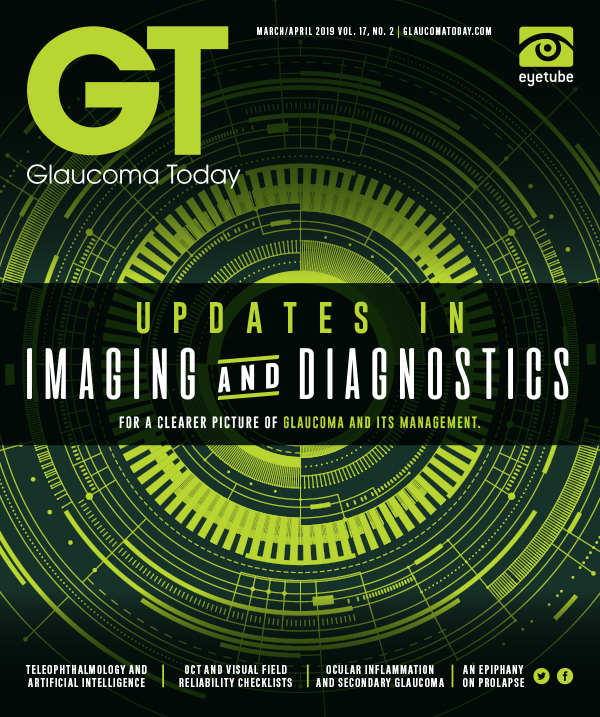 • Combining information from OCT, fundus imaging, visual field testing, and clinical examination can help clinicians confirm the presence or absence of glaucoma. • By recognizing patterns in OCT reports, clinicians can better understand which parameters to prioritize when evaluating glaucomatous progression. In the event of disagreement among these diagnostic tools or uncertainty about their results, the images provided by OCT devices can serve as important tools for adjudication. Ultimately, it is important to bear in mind that the summary parameters provided on the printout are derived from the images; therefore, examining the images themselves can shed light on possible reasons for discrepancy between the information provided by the parameters and the rest of the clinical picture. 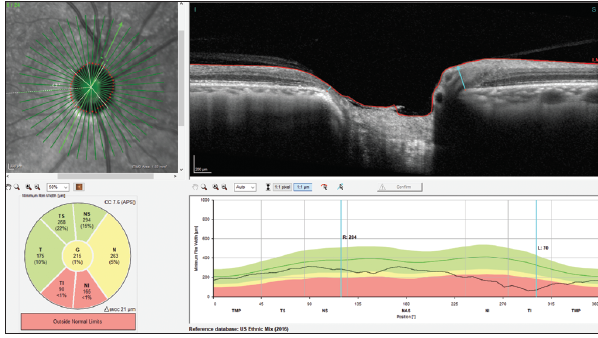 The clinician can reduce uncertainty by reviewing the images provided by OCT.
To better understand how OCT and imaging data are used in diagnosing and managing glaucoma, scientists from Heidelberg Engineering observed hundreds of cases in collaboration with clinicians around the world. This investigation revealed that, approximately 20% of the time, the quantitative data provided by OCT devices added another layer of uncertainty, were misleading, or were disregarded by clinicians. These scenarios occurred routinely and showed recurring patterns. The company therefore conceived The Glaucoma Imaging Atlas to compile a set of cases demonstrating how OCT information can be fully utilized for the diagnosis and management of glaucoma. These cases highlight scenarios in which the quantitative data from OCT devices in the form of summary parameters could result in uncertainty or could be misleading, and they demonstrate how these limitations can be mitigated by the clinician by fully reviewing the OCT scans. By gaining a better understanding of the common themes, patterns, and discrepancies in glaucomatous presentations, clinicians can ensure that OCT data increase their diagnostic confidence and certainty, rather than adding uncertainty. When clinicians learn to recognize these scenarios, they can optimize their use of OCT technology and more effectively implement it into their routines. Data included in the reference databases of OCT devices have 95% to 99% specificity cutoff values and have been carefully assessed by technicians, investigators, and reading centers. These data are dependent on the inclusion and exclusion criteria of their respective study protocols, and they have undergone thorough quality assurance checks. 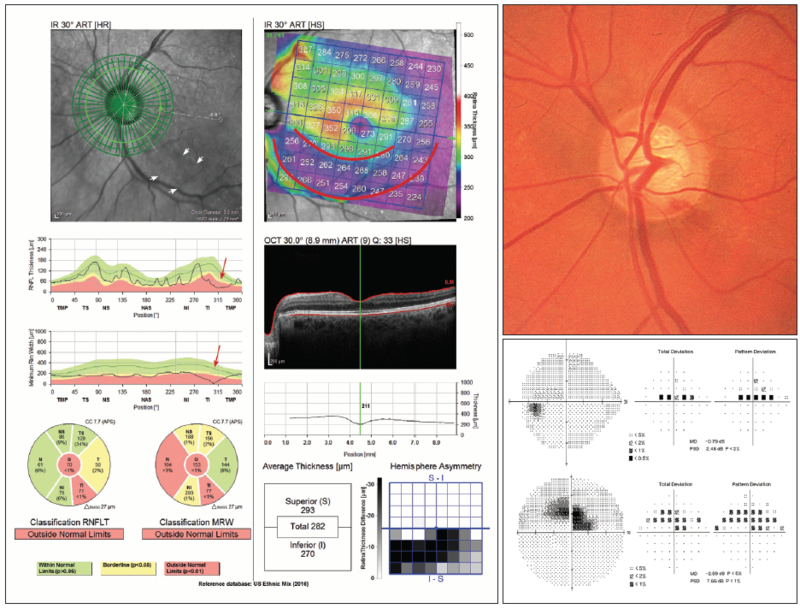 It is important for clinicians to understand that these databases include patients with certain characteristics, such as a refractive error of between +6.00 and -6.00 D, astigmatism of ≤ 2.00 D, and axial length of ≤ 26.0 mm. 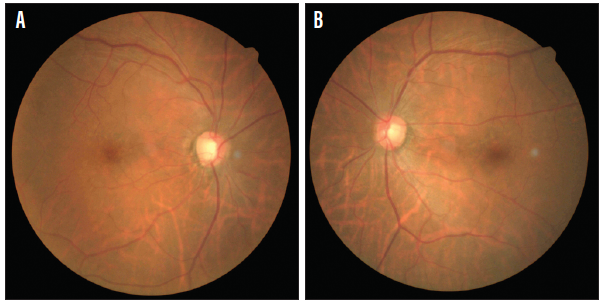 The patients included have no retinal disease, no history of intraocular surgery, and IOP ≤ 21 mm Hg. Highly myopic eyes or eyes with tilted optic nerves are not necessarily included in a device’s reference database, and the same may be true for other anomalies. Therefore, when clinicians encounter patients with such characteristics in the clinic, they should take note, as this anatomy could lead to a misdiagnosis when compared with the OCT device’s reference database. Combining information from OCT, fundus images, VFs, and clinical examination helps clinicians confirm the presence or absence of glaucoma. By recognizing patterns, clinicians can better understand which parameters to prioritize when evaluating glaucomatous progression. The cases described herein provide examples of uncertainty in which further investigation is needed to make an accurate assessment. Figure 1. In Case No. 1, the confocal scanning laser ophthalmoscopy infrared fundus image showed an extensive RNFL wedge defect (white arrows). RNFL thinning was seen in the TI sector, and BMO-MRW analysis showed thinning in this region (red arrows). The OCT-derived BMO-MRW measurements confirmed clinically observed rim loss and suggested extensive ONH damage. The posterior pole asymmetry analysis showed significant total retinal thinning representative of arcuate RNFL loss (red outline), extending to the macular area as indicated by the red curves in the total retinal thickness color map. Courtesy of Felipe Medeiros, MD, PhD, and Heidelberg Engineering Glaucoma Imaging Atlas. A 63-year-old woman with primary open-angle glaucoma presented with a flame-shaped optic disc hemorrhage in the temporal inferior region of her left eye (Figure 1). Although the optic disc showed some rim thinning and an adjacent disc hemorrhage, subjective assessment of the photograph did not fully convey the extent of the neuroretinal rim loss inferiorly. Some points were abnormal on 24-2 standard automated perimetry, but the amount of damage also appeared relatively minor on this test (mean deviation of -0.79 dB). SD-OCT analysis with the Spectralis Glaucoma Module Premium Edition (Heidelberg Engineering), however, revealed the extent of structural damage. The RNFL defect was clearly delineated, and it was possible to see a significant drop in the temporal-superior-nasal-inferior-temporal (TSNIT) thickness plot. A similar finding was seen with the Bruch membrane opening–minimum rim width (BMO-MRW) parameter. The macular thickness map showed an important and extensive area of thinning extending close to the fovea. The SD-OCT macular findings carried important prognostic information for the patient, showing the severity of structural damage. It is important to inspect the neuroretinal rim, circumpapillary RNFL, and macular OCT images for quality, taking note of confounders such as the presence of artifacts or other pathology. The results from these images can be affected by coexisting diseases such as macular degeneration. It is key to examine B-scans and search for artifacts resulting from inaccurate segmentation of retinal layers, which can result from vitreomacular traction, the presence of epiretinal membranes, or other conditions. Based on the careful observation of the OCT images, no artifact was seen, and the extent of structural damage was confirmed by all three diagnostic parameters (ONH, RNFL, and macula). These parameters can then be used to monitor this patient for subsequent progression. 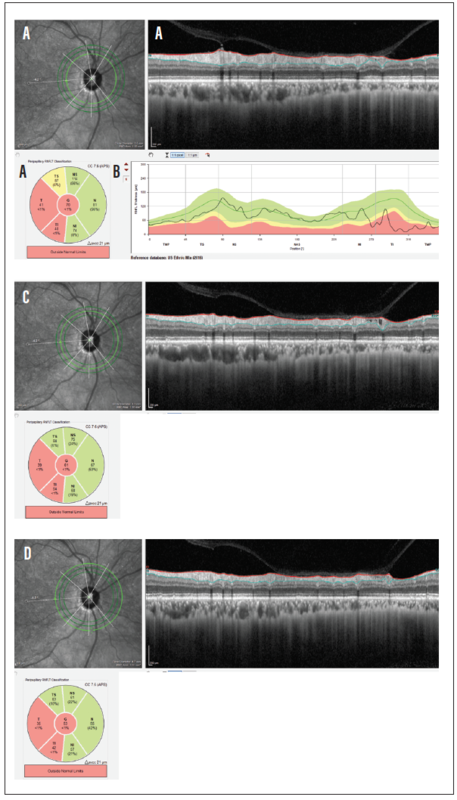 A 62-year-old woman with primary open-angle glaucoma, a family history of glaucoma, and no previous surgery presented with glaucomatous optic disc cupping in the right eye and suspicious optic disc cupping in the left (Figures 2 through 8). Standard automated perimetry revealed extensive superior hemifield sensitivity loss, a defect that was confirmed on OCT. Close inspection of B-scans derived from SD-OCT revealed a partial posterior vitreous detachment (PVD), which can mask RNFL damage and can confound future changes. The BMO-MRW neuroretinal rim and macular thickness measurements are not at risk of being confounded by the partial PVD. Figure 2. In Case No. 2, a posterior vitreous detachment (PVD) obscured the extent of damage. Optic nerve disc photos showed cupping in the right eye, especially temporally, and suspicious cupping in the left eye. Figure 3. Standard automated perimetry results for the right eye (A). The greyscale representation of VF showed extensive loss of sensitivity in the superior hemifield and potential early loss in the inferior hemifield. The total deviation (B) and pattern deviation (C) maps confirmed that these defects were statistically significant. Courtesy of Brian C. Samuels, MD, PhD, from Heidelberg Engineering Glaucoma Imaging Atlas. Figure 4. Standard automated perimetry results for the left eye (A). The greyscale representation of the VF was not indicative of a clear glaucomatous pattern of sensitivity loss. The total deviation (B) and pattern deviation (C) maps indicated a statistically significant but scattered loss of sensitivity in both hemifields. Figure 5. Results from the 3.5-mm RNFL circle scan, the six-sector Garway-Heath analysis, the TSNIT profile, and the B-scan confirmed extensive RNFL thinning in the temporal regions (A, B). The 4.1-mm scan (C) and the 4.7-mm scan (D) showed the partial PVD that masked the extent of the damage in the TS sector. This common case presentation illustrates a primary lesson regarding OCT printouts. The red/green RNFL thickness color coding is helpful as a generalized overview, and physicians should evaluate coding alongside other factors when reviewing OCT data. A review of the B-scans to evaluate the quality of the scan as well as the segmentation is needed. The vitreous interface can often be seen either above the retina after a partial PVD or with some areas still attached in a progressing partial PVD. Where vitreous is still attached, the retina is likely artificially thickened or pseudothickened. In a healthy eye, this pseudothickening may present as retinal thickness above normal limits, easily identified as an artifact. Similar thickening artifacts, however, can be seen in thinner retinas that make them appear normal (ie, green). Until the partial PVD has completely resolved, the clinician should watch for changes in the corresponding VF. If a new area of focal thinning is observed, physicians should not advance treatment without first confirming the status of the partial PVD. Figure 6. The BMO-MRW six-sector Garway-Heath map results indicated borderline neuroretinal rim thinning with significant thinning of the inferior neuroretinal rim. The TSNIT profile and the associated B-scans confirmed the extent of the damage in the inferior regions. Figure 7. The total retinal thickness color map (A) indicated advanced asymmetric inferior total retinal thickness damage, which was confirmed with the posterior pole asymmetry analysis (B). The ganglion cell layer thickness map (C) confirmed that damage was due to ganglion cell degeneration. A B-scan through the macula (D) showed that the partial PVD did not affect the ganglion cell layer thickness measurement. Figure 8. The 12º RNFL circle scan sector analysis indicated global borderline RNFL thickness. Close inspection of the TSNIT profile and B-scan indicated potential RNFL damage in the TS and TI regions (red arrows). There were also cystic changes observed in the TS regions, adjacent to a partial PVD (white arrow). Although segmentation algorithms are good and continue to improve, they are not always perfect. Physicians must closely review B-scans and their segmentations to determine the cause of a change. 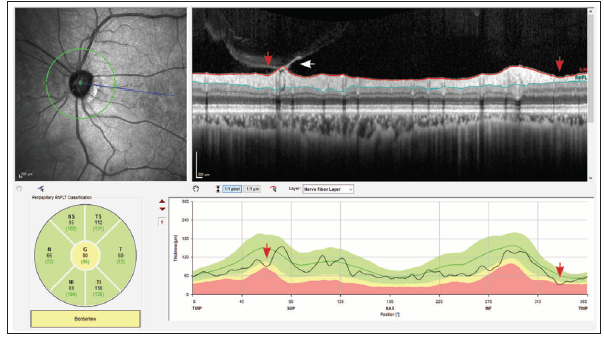 When clinicians are empowered to use SD-OCT data fully, they can more completely identify whether structural and functional measures validate the extent of damage seen in the ophthalmic examination. A more complete understanding of each individual parameter’s value within a report can improve clinical monitoring and management of patients with glaucoma. • Associate Professor of Ophthalmology, Director of UAB Glaucoma Division, and Director of the UAB Glaucoma Fellowship.